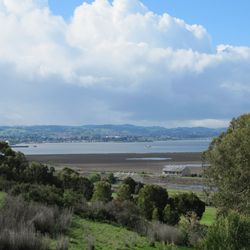 Over the past several years, the Vallejo Watershed Alliance has hosted a series of presentations on restoration and water issues. This August, we are delighted to welcome Steve Dunsky and Miranda Hutten from the U.S. Forest Service (USFS). Miranda is the Urban and Community Forestry Program Manager at the USFS, and will talk about how the Service connects to our community through restoration projects and creek cleanups, and the importance of trees to maintain a healthy city. Steve is a producer and director of films and videos at the USFS, known for such groundbreaking films as Green Fire, The Greatest Good, and Butterflies and Bulldozers. He is also the mastermind behind Visions of the Wild, a unique celebration of wilderness on the 50th anniversary of the signing of the Wilderness Act. Steve will talk about Visions of the Wild H20, a celebration of water and watersheds, coming this October. The USFS presentation will take place on Saturday, August 29 from 9 a.m. to 10 a.m. at the Dan Foley Cultural Center/Vista Room. After 10 a.m., Alliance members will calendar events for the next twelve months. Members of the public are invited to come for the presentation or the entire meeting. All are invited; refreshments and parking are free. Please RSVP to info@VallejoWatershedAlliance.org or call (707) 644-8949 ext. 292.